The Tech Report writes Microsoft is toying with projected, pocketable touch interfaces. You can read more details about these technologies over here. 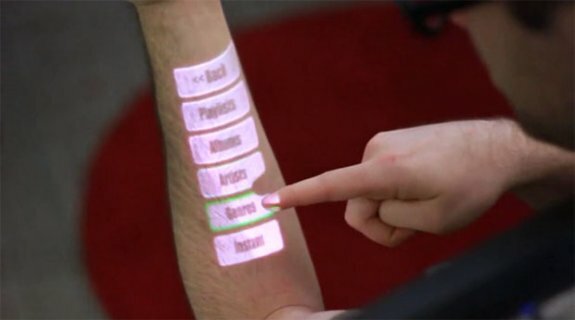 At the Association for Computing Machinery's 24th Symposium on User Interface Software and Technology, Microsoft is unveiling a couple of touch-based interface projects that its researchers have been working on for a number of years. The first and most outlandish is OmniTouch, which ditches touchscreens in favor of an interface that can be projected on any surface the user chooses. OmniTouch relies on a shoulder-mounted projector and camera, which work in tandem to draw interface elements and track your finger's interaction with them. The system is described as being similar to Kinect but optimized to work at short range. Although the existing OmniTouch prototype looks a little unwieldy, the researches say there are "no significant barriers" to making the device much smaller.